The 260 Remington is an excellent rifle cartridge if you are looking to hunt medium size game animals and are sensitive to recoil. It’s important to know that recoil sensitivity is a combination of many factors: amount of recent practice shooting firearms, physical fitness, shoulder and joint health and the neurological pain threshold. There is no reason not to ‘step down’ in caliber and ‘step up’ in practice shooting that caliber if your body is better served by a lower recoiling weapon. A famous American actor once said “a man has to know his limits.” If your body is saying ‘step down’ … put the macho aside and step down. There is a reason. One such solution to the recoil problem of the medium rifles is the 260 Remington. It is a 308 Winchester cartridge necked down to shoot 0.26” diameter bullets. A 308 Winchester cartridge firing a 150gr projectile produces 2650 ft-lbf of kinetic energy at the muzzle. A 260 Remington cartridge shooting a 140gr projectile produces 2250 ft-lbf of kinetic energy at the muzzle. This accounts for the reduction in recoil—it produces less kinetic energy at the muzzle than the 308 Winchester. Bottlenecked cartridges require very specialized propellant in order to outperform the host cartridge that has less cartridge taper or ’bottlenecking’. This helps to explain the disparity in performance between the two cartridges. Invest in steel, wood and American craftsmanship. A 260 Remington shoots a bullet with a 0.264” diameter while the 308 Winchester utilizes a 0.308” bullet. The larger the diameter of a bullet, the greater the wind resistance—all else being equal. Let’s use Federal Cartridge’s data for the velocity degradation of these two cartridges in air to highlight another advantage of the 260 Remington cartridge. The red line represents the performance of the 308 Winchester cartridge at range and the blue line represents the 260 Remington cartridge at range. Notice the lines starting to converge as the range increases. This is due to the improved aerodynamics of the round … but consider the odds that your humane hunting distances will extend beyond 500 yards. The advantage of the smaller diameter bullet, for most people, is then a moot point. 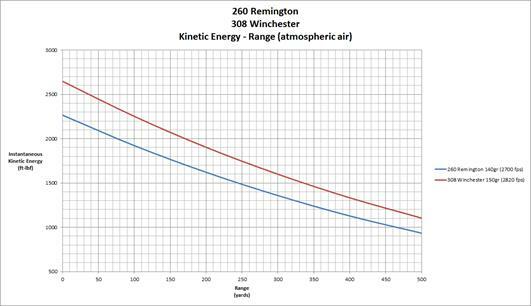 But what is notable is the similarity in shape of the two curves—the 260 Remington is essentially a slightly 20% less ‘powerful’ 308 Winchester, but the downrange ballistics are still suitably similar for medium game hunting. One of the problems with bottlenecked cartridges that operate at high pressure and have a large ratio of case maximum diameter to neck diameter is the limited range of bullet weights that can function safely with the cartridge. This is the case of the 260 Remington, so the best usage is on small to medium game and varmints at extended ranges. Bullets heavier than 140gr are generally not available so usage on game larger than deer is to be discouraged. For general usage I recommend a 140gr expanding bullet that shoots precisely in your weapon.